Located in Kinnaur Valley of Himachal Pradesh state of India, Mount Kinner Kailash (6050 m) is listed among one of the five mount Kailash. This place is believed to be the home of Load Shiva from where he regulates the Universe. The Parikrama or circumambulation at this place starts from Kalpa via Triung valley and back to Kalpa via Sangla valley. Many pilgrims visit this sacred place every year. Mount Kinner Kailash holds a religious significance among the Hindus because of the huge "SHIVA LINGAM", which is a 79 feet vertical rock formation that looks like a Shivlinga. This rock formed representation of Lord Shiva believes to change its colors throughout the day. Situated at Indo-Tibet boarder, entry to Kinnaur valley was restricted even for Indian nationals till 1993 and even today for foreign nations, tourists from foreign countries need to register themselves with Inner line permit. This trek will take you to the land of fairy tales from where you can have a stunning view of cold desert mountains, snow-clad peaks, lush green valleys and fields of beautiful orchard flowers. Also, you can witness amazing view of the spectacular landscape. Kinnaur is the most scenic but less known district of Himachal Pradesh, located on the Indo-Tibet border. It is surrounded by Tibet on the east, Garhwal Himalaya trek on the south, Spiti Valley on the north and Kullu on the west. The Sutlej River, which rises on the southern slopes of Kailash Parvat near Mansarovar in Tibet flows through the Kinnaur valley. Due to the proximity of Kinnaur to Tibet, the life style and religion of its inhabitants had been influenced by Buddhism, mostly in the northern and central regions, although the majority of the people practice Hinduism. 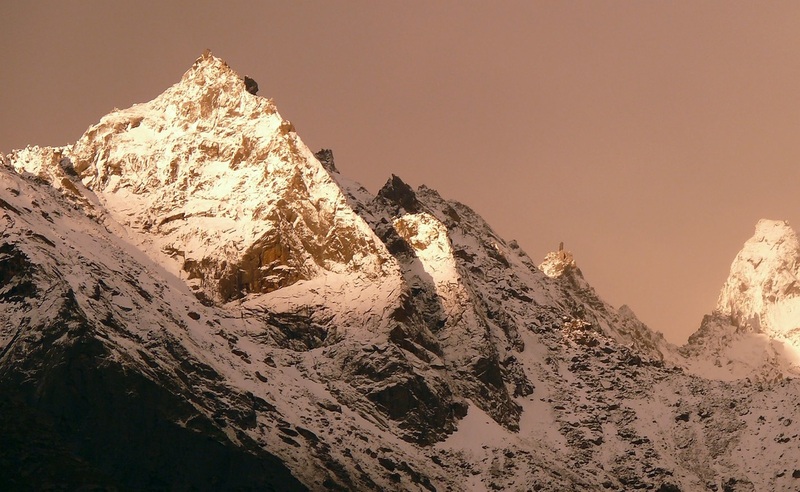 Kinnaur holds three of the world's grand mountain ranges - the Zanskar, the Greater Himalaya and the Dhauladhar. Kinnaur invariably leaves an indelible impact on the travelers because of its unmistakable and intense spiritual aura and palpable Himalayan Mysticism. For this is the land where Lord Shiva is believed to reside on the Famed Mount Kinner Kailash considered to be one of his favourite haunts. Kinnar Kailash Parikrama trek is also known as Charang Pass / Lalanti Pass Trek takes us to Kinnaur, Charang pass trek is high altitude trek in the Kinnaur valley. Kinnaur Kailash Parikrama is one of the toughest treks in Himachal, around the holy Mount Kailash, also called Kinner Kailash in Kinnaur. 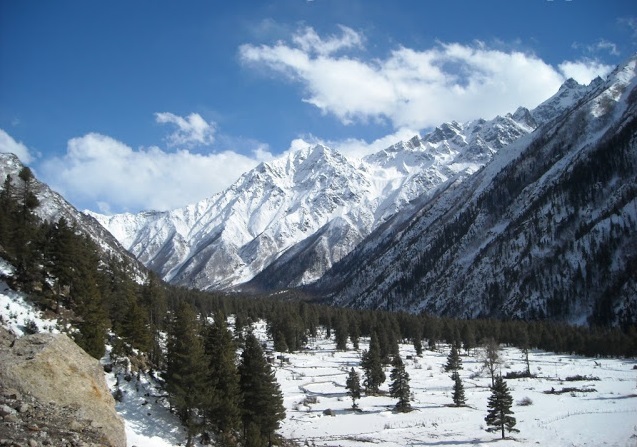 It’s a 60 Km trek, which starts in Thangi through Charang, Lalan Ti, crossing Charang La pass (17,194 ft) and ends in Chitkul village – the last inhabited village accessible by road, near the Indo-Tibet border in Baspa valley of Kinnaur, Himachal. Mostly done by pilgrims, it’s a difficult trek and there are no specific directions to follow, just a few stones kept on top of each other by former trekkers marks the path. There is no cellular connectivity here or any villages on the way, so unless you have a compass and a map, or a guide, you’re sure to get lost. It’s a non-touristy, difficult trek and the most difficult part is the climb up Charang La pass and ends at one of the most beautiful and remote places in Kinnaur – Chitkul village. we drive through Kufri, Narkanda through dense forest to reach Kalpa. During this season the fragrance of Apples is enticing and luring enroute. Is home to some of the best apple and chilgoza orchards in the world. It also offers a breathtaking panoramic view of the 6050 mtrs. High Kinner Kailash range. Overnight in Kalpa in hotel. We drive our way towards Lambar village, amidst beautiful landscapes but adventurous roads. Situated high above a deep gorge, with the old village perched even higher and looking extremely picturesque. Arrive and camp for overnight. Rest of the day at leisure for Acclimatization. The trek to Charang follows the river over riverbed moraine and is mostly along the riverbed before it crosses Charang River. It is a long trek but not difficult. Halfway there is an ITBP camp where you are supposed to register your name before proceeding further. A permit is also needed from the District Commissioner of Recong Peo. We come across Kunu Temple in the way. There is a PWD rest house and a 400 year old Charang Devi temple after a 45 minute steep climb from there. Charang is the last village on this side of the Indo - Tibet border. We camp here tonight. Today is a long and tiring climb towards Lalanti. We will start around 6 in the morning for Lalanti aware that we would have to cross a pass above 15,000 feet. The views from the top are superb. From the top one can see the small village of Kunnu which is a detour from Lambar and Charang. In the distance, peaks bordering Tibet can also be seen. The path after the pass is extremely difficult and hazardously narrow to mane uver. We have to wade across several streams. Lalanti has beautiful meadows with thousands of high altitude flowers. It is a yellow and red vast spread carpet of flowers under an open blue sky with roaring sound of gushing Mountain Rivers adds to the scenic beauty and overall experience. We camp next to stream in Lalanti. Vegetation is sparse in Lalanti. On the right, the river bed rises to the glacier point on Charang La pass (5200 meters). We will find ourself going through a series of gradual ascents and descents on loose rocks. We can see the Charang la pass at a distance. We will be required to ascend the moraine ridge. Breath taking views of clear sky and snow clad peaks welcome us. There is a walk over a glacier moraine till we come across huge boulders and a pond formed by the glacial water. We will see a commanding view of mountain ranges covered with snow on either side. We will also see overhanging edge of snow also called cornice. On the right ridge you can see a peak that looks as sharp as a needle. We will come across a huge glacial lake and two huge boulders of around 30 feet near the lake and a small stone temple that has a few trishuls. Trishul or trident is the primary weapon of Lord Shiva. It depicts the power of Lord Shiva. Many pilgrims who come for Kinnaur Kailash parikrama worship Lord Shiva, offer prayers and seek His blessings. We will camp near the boulder besides the glacial lake. To acclimatize we will go around the glacial lake and check the peaks visible from here. This is the most difficult day of the trek due to a lot of altitude gain and a steep descent. The trail goes through glacier moraine, snow bridges (thin layer), rocky terrain and huge boulders so be very careful and follow the guide. After crossing several streams we start our climb for the pass. The trail is covered with snow in patches. There is no water on the trail for most part. We will see the snow slope has a steep gradient of around 60-70 degrees. The slope is challenging so you have to be very careful where you stop. The bird’s-eye view of the valley below is amazing from here. After the snow patch the trail is made of loose rocks and plenty of scree. The view from the pass is breathtaking and memorable we have serene and beautiful views of many virgin peaks, hanging glaciers and towering rocky mountains. After a quick snack we will move ahead. The trek down to Chitkul is long and steep descent. Trail passes through rocky terrain and loose boulders. The trail alternates between snow patches and rocky terrain. Near Chitkul view gets greener and better as one comes across colorful flowers and shrubs along the way which is a refreshing change. After crossing the fields and the beautiful village temple we reach Chitkul. 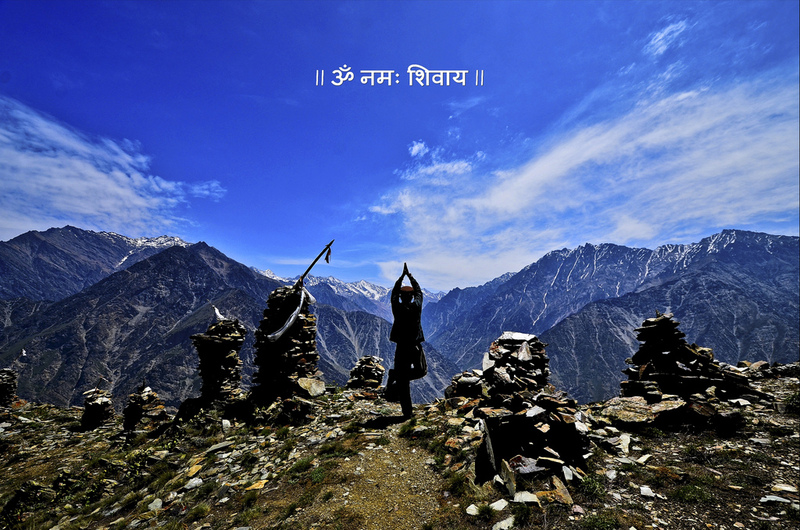 We pay respects to the godess in Chitkul and camp on plain pastures of one of the most beautiful villages of Himachal. Today we do sightseeing around Chitkul village and it's houses with either slate or wooden plank roofs, a Buddhist temple and a small tower. The Kagyupa temple has a highly valued old image of the Shakyamuni Buddha, a Wheel of Life mandala and four Directional Kings on either side of the door. Chitkul is practically the last point of the famous Kinner Kailash Parikrama as we can drive our way back towards Powari. The powerful goddess of Chitkul is the only non-Buddhist deity to which respect must be paid by the Parikrama pilgrims. The valley is extremely beautiful, on the left bank of the Baspa River are snow-clad mountains and on the right bank the whole terrain is full of apple orchids and wooden houses. We go back today with beautiful memories and pictures of the wonderful trek. Hope to see you again. Click here to know whats included in your package and what you need to pack?